Total thyroidectomy is the most common surgical procedure for the treatment of thyroid diseases. Postoperative hypocalcemia/hypoparathyroidism is the most frequent complication after total thyroidectomy. 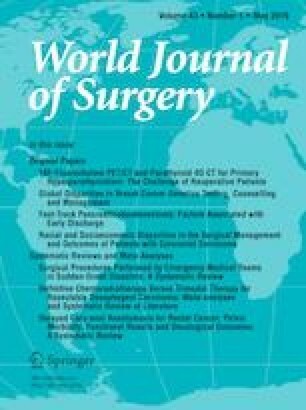 The aim of this study was to evaluate the rate of postoperative hypocalcemia and permanent hypoparathyroidism after total thyroidectomy in order to identify potential risk factors and to evaluate the impact of parathyroid autotransplantation. We performed a retrospective analysis of 1018 patients who underwent total thyroidectomy at our institution between 2000 and 2016. Medical records were reviewed to analyze patient features, clinical presentation, management and postoperative complications. Descriptive and inferential statistics were employed based on the natural scaling of each included variable. Statistical significance was set at p ≤ 0.05. Mean ± SD age was 46.79 ± 15.9 years; 112 (11.7%) were males and 844 (88.3%) females. A total of 642 (67.2%) patients underwent surgery for malignant disease. The rate of postoperative hypocalcemia, transient, protracted and permanent hypoparathyroidism was 32.8%, 14.43%, 18.4% and 3.9%, respectively. Permanent hypoparathyroidism was significantly associated with the number of parathyroid glands remaining in situ (4 glands: 2.5%, 3 glands: 3.8%, 1–2 glands: 13.3%; p ˂ 0.0001) [OR for 1–2 glands in situ = 5.32, CI 95% 2.61–10.82]. Other risk factors related to permanent hypoparathyroidism were obesity (OR 3.56, CI 95% 1.79–7.07), concomitant level VI lymph node dissection (OR 3.04, CI 95% 1.46–6.37) and incidental parathyroidectomy without autotransplantation (OR 3.6, CI 95% 1.85–7.02). Identification and in situ preservation of at least three parathyroid glands were associated with a lower rate of postoperative hypocalcemia (30.4%) and permanent postoperative hypoparathyroidism (2.79%). The original version of this article was revised: the last three column headings in Table 3 were mislabeled. A correction to this article is available online at https://doi.org/10.1007/s00268-019-05002-1.